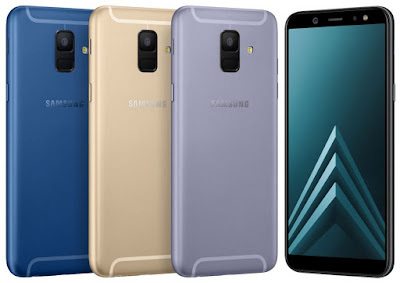 Samsumg Galaxy A6 and A6+ finally unvieled after so many leaks.However,its price and availability is still unknown.Both devices comes fullview display and Samsung Bixby virtual assistant.The phone are running on Android 8 Oreo with Samsung Experience. 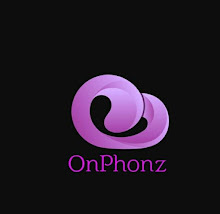 The phone cones with 5.6 inch Super AMOLED HD+ display with 1480×720 pixel resolution and 18:9 aspect ratio.For photography,it has 16 MP sensor with f/1.7 aperture and LED flash on rear and 16MP sensor with f/1.9 aperture on front with screen flash.It will be powered by 1.6 GHz Exynos 7870 octa core processor with 3GB RAM and 32 GB ROM.Its storage can be expand further upto 256 GB via sd card slot.The hardware will be backed up with 3000 mah battery.The phone is equipped with finger print scanner and face recognition for security. 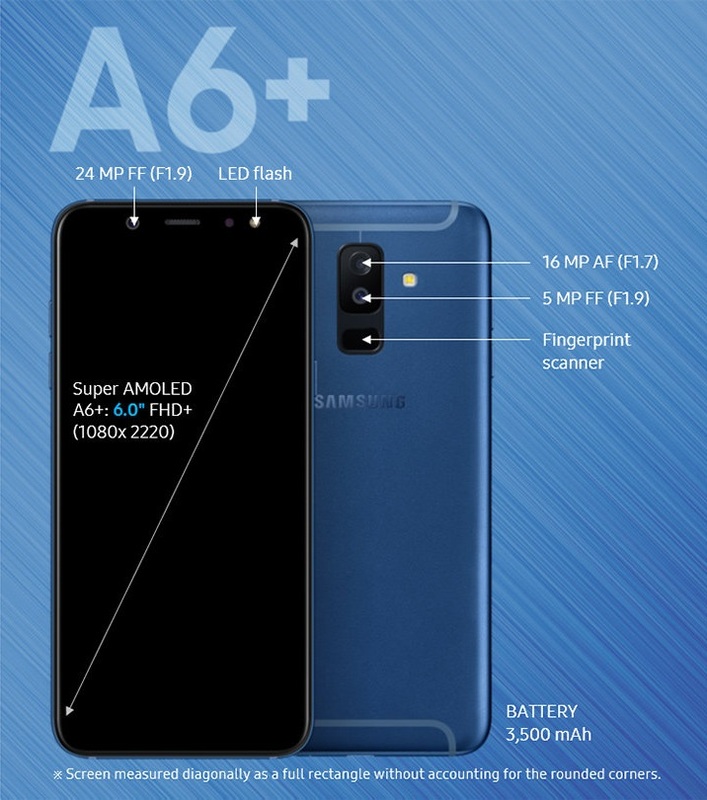 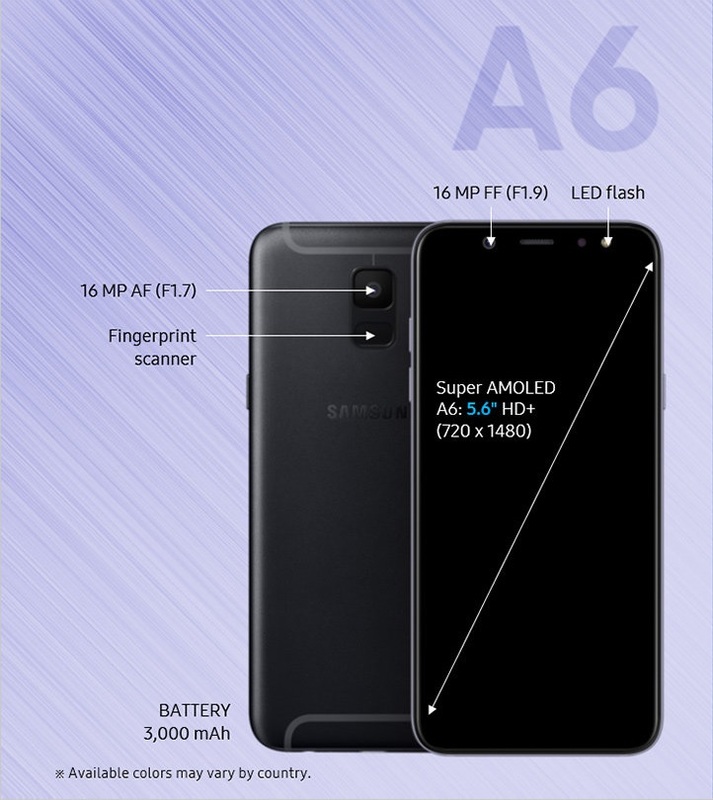 As it named plus,the device is some more expensive than A6 and it is an upgraded version of Galaxy A6.Talking about its features,it is equipped with 6 inch Super AMOLED FHD+ display with 18:9 aspect ratio and 2220×1080 pixel resolution.For optics,it sports dual camera setup with 16MP with f/1.7 aperture primary camera and 5MP with f/1.9 aperture secondary camera.For selfie,it has 24MP single lens with f/1.9 aperture.The cameras are aided with LED flash on rear and screen flash on its front.To power up the device,it comes with 1.8GHz Snapdragon 450 octa core processor and Adreno 506 GPU with 4GB RAM and 32 GB ROM.It also allows expansion of storage upto 400GB via sd card.And it is juiced with 3500 mah battery.